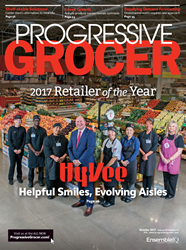 Progressive Grocer has selected West Des Moines, Iowa-based supermarket chain Hy-Vee Inc. as its 2017 Retailer of the Year, the leading retail grocery trade publication’s highest honor, bestowed annually in its October issue. At No. 13 on PG's Super 50 ranking of the top grocery retailers, Hy-Vee has proved itself to be an innovator and leader in key areas of importance: different store formats to better serve diverse markets, investment in click-and-collect services, chef-inspired prepared foods, in-store dining, health and wellness, and diversification in products and services, all toward the overarching goal of serving consumers at the highest level by delivering customized solutions for every need state. "At a time when the retail industry is being reinvented at a rapid rate, Hy-Vee is not only forward thinking, but forward doing," said Jim Dudlicek, editorial director of Progressive Grocer. "Its traditional helpful smiles are found in its evolving aisles -- evolving to deliver the fresher, healthier, more personalized shopping experience that consumers are demanding." PG’s full Retailer of the Year profile story appears in its October 2017 issue, available in print and at Progressivegrocer.com. PG's editorial team will present the award to Hy-Vee officials at a ceremony scheduled for late October. Employee-owned Hy-Vee operates 245 stores in eight Midwestern states.